1,2,3…CHEESE! 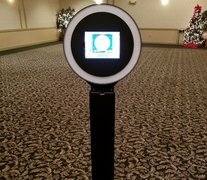 If you are hosting an event to remember, you will want our state of the art Photo Booth Rental from Crazy Monkey in Erie, Pa. Our photo booth is very different from your traditional large and bulky photo booth. This awesome event rental is small space friendly and extremely easy to use. Once you snap your photo it can be sent directly to your phone or email to share anywhere that you would like as well as be digitally printed with a custom logo. Our touch screen is easy to use and lots of fun! We have a large selection of event rentals, check out our Tents, Tables, & Chairs! Crazy Monkey Inc. is located in Erie, PA and serves all the surrounding areas including Fairview, Girard, Waterford, McKean, Edinboro, Harborcreek, and many more for their inflatable party needs! Travel fees may apply in some areas. We pride ourselves in clean bouncers, affordable prices, and great customer service! Crazy Monkey Inc. is also fully insured for a worry-free bounce house rental experience! You can count on our professional staff to deliver your rental on time and with your satisfaction own mind. Call us at 814-456-5867 or CLICK HERE to reserve your Photo Booth Rental today!